As any woman – and probably a fair few men too – will tell you, not all trousers were created equal. I have no problem in admitting I am a curvy lady! I have that classic hourglass figure that people admire…until they try to dress it. My small waist, child-bearing hips and tree-trunk thighs that even a lumberjack would have problems with were not designed to take any trousers off the rack. For most of my adult life, I searched for the ‘perfect pant’. The one that fits at the waist but doesn’t stretch across my thighs so they look like sausages in skin. The ones that fit in the thigh but don’t gape at the waist when I sit down (a.k.a. an open invitation for frat boys to stick pencils down the gap in class)! Levi comes with pretty close with its CurveID range – I’m a demi curve for anyone interested – but I can’t wear jeans to work. So when I learned to sew over 5 years ago, it was always with the intention of learning to sew a tailored, form-fitting, non-muffin-topping pair of Made FOR Zoe trousers. And now I’ve done it. Presenting my own custom-fit trousers! I used a pattern as my base for developing a mock-up in calico – it was enough just to make trousers never mind draft a new pattern. I chose the Thurlow Trouser by Sewaholics – Australian sewers can purchase it from SewSquirrel without incurring the nightmare exchange and postage rates. 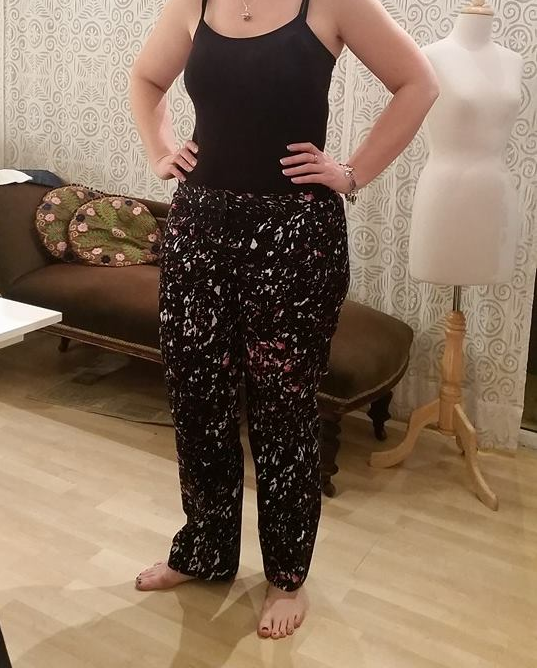 Sewaholic patterns are specifically made for the more pear-shaped figure so their trousers are perfect for my shape. I picked my size and only had to make very minor adjustments to the thighs and straighten the flare leg. The instructions are a breeze, especially with the elements such as a zipper fly and welt back pockets, which i had never done before. I picked up a nice cotton sateen from Spotlight as my main fabric and a cotton/silk mix for the pocket linings as I wasn’t splashing out on my first try. Cotton sateen is really easy to sew and it also has a bit of stretch to it which was perfect. As you can see from the photo, I picked a more dressy looking fabric than I would normally wear to work so me and the girls are hitting a Spanish restaurant on Friday night to officially launch my trousers – hopefully I get a “Hola Bella dama”! I'm a writer with writers block, a sewer with no space left in my wardrobe and reader with a broken Kindle. Blogging is a final ditch attempt at saving my sanity. As you read on, you may question if I had any sanity to start with!